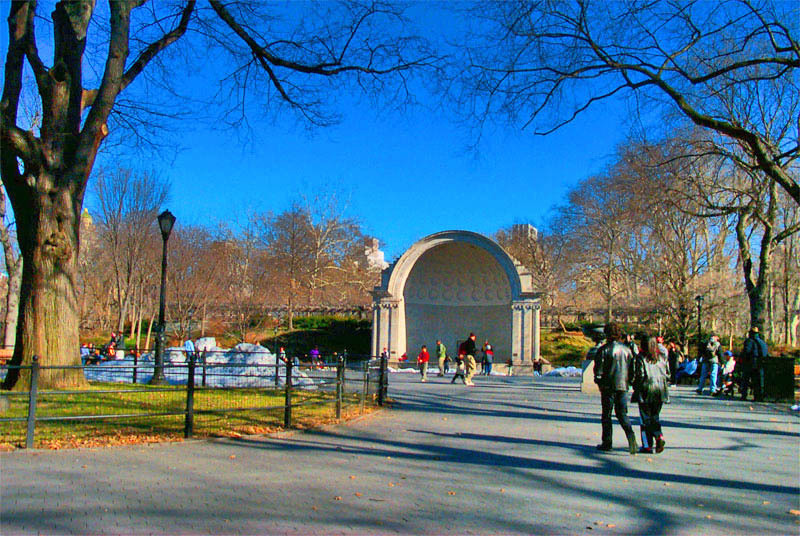 Miami In Focus Photo Gallery of the Naumburg Bandshell C71 in Central Park. Located within the Central Park Mall on its eastern edge directly beneath the Wisteria Pergola, stands the lone Naumburg Bandshell. This neoclassical limestone Bandshell, a gift of banker Elkan Naumburg, replaced an earlier cast-iron bandstand that was designed by Jacob Wrey Mould. The original bandstand was demolished in 1922, and a year later the concert ground was enlarged to accommodate larger audiences. The pavement where gilded birdcages and fountains once stood was paved with asphalt. A number of elms were cut down and some benches were removed. 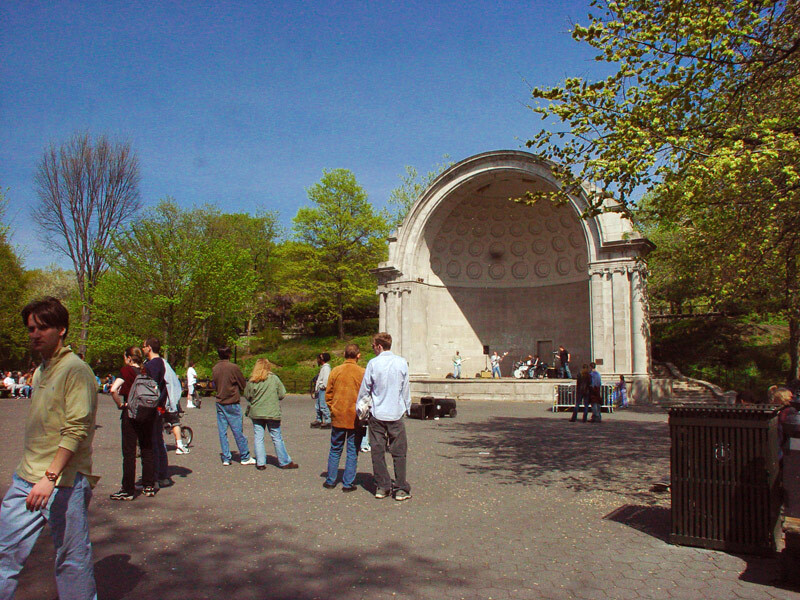 From 1923 to 1969, this current Bandshell has served as an outdoor theater featuring musical events. Over the years, thousands of people would gather to hear marches, arias, show tunes, opera companies, jazz, Latin and rock bands, all for free. Some famous performers who graced its stage included Irving Berlin, Duke Ellington, John Phililp Sousa, and the Grateful Dead. It is also the place where Rev. Dr. Martin Luther King Jr. once spoke and where John Lennon was eulogized. 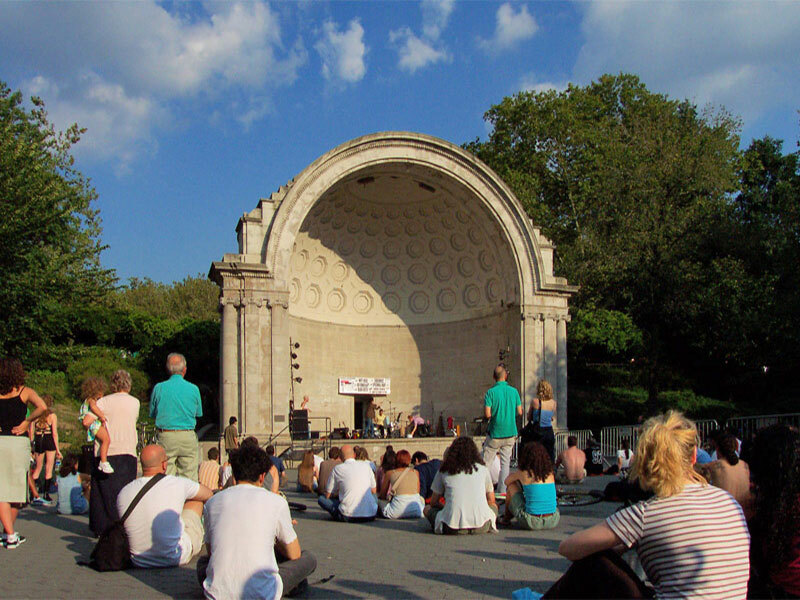 During the late 1980s, a new music festival called Summerstage was introduced at the Naumburg, which after a few seasons was moved to the more spacious Rumsey Playfield. Today, the Parks Department does allow various events to be staged at The Bandshell and many of them in their diversity come as a great surprise to the numerous visitors and passerbys to the Mall.